The representative body for male, female and past AFL player members. The AFL Players’ Association is a respected advocate for its members, the broader community and the game. It is passionate about instilling a sense of integrity and belonging, and showcasing players as people first and athletes second. It is the belief of the AFLPA that a core asset of the AFL are its players and, as key stakeholders of the game, players deserve to continue to have their voices heard on all issues pertaining to themselves and the game. The existing AFLPA website was difficult to navigate and challenging to effectively manage content. The site needed to be re-developed to ensure a more user-friendly experience, including a strategy to allow readers to find other content and hence keep users on the site. Active promotion of the website was also required to increase engagement and awareness of the AFLPA. 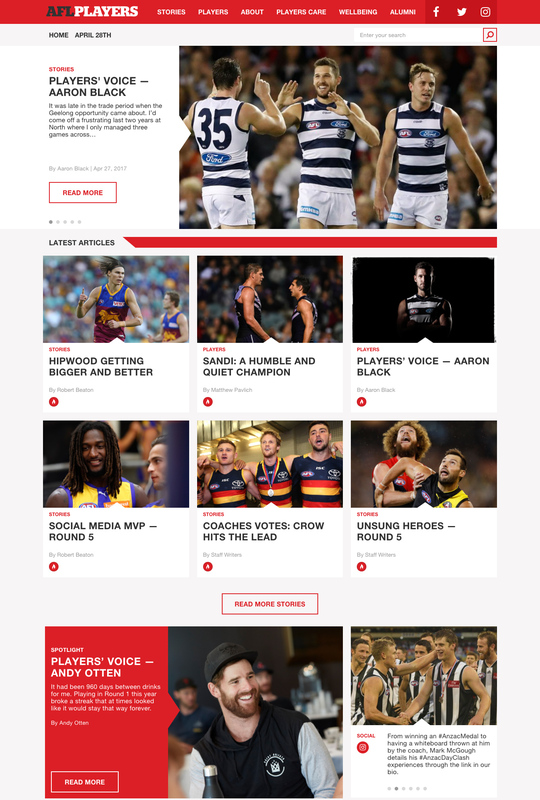 We were responsible for the development of the AFLPA website, partnering with our friends at Sherwood to deliver the design.